The most popular hijacked passenger car was the VW Polo. The most popular passenger SUV was the Toyota Fortuner. 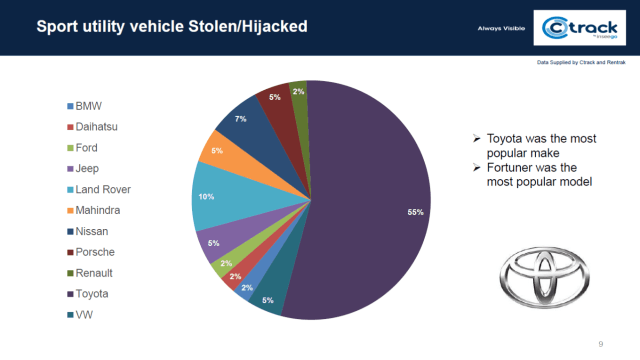 It comes as no surprise that the most hijacked vehicles are also the bestselling ones in South Africa. How Can I Reduce the Risk of Getting Hijacked? There is nothing you can do to prevent getting hijacked, although there are steps you can take to reduce your risk. Always keep your car doors locked and your windows closed. When stopping at a red light, leave some space between your vehicle and the one in front of you. If you don’t have to come to a complete stop, don’t! Many hijackings occur in residential driveways. Try to open your gate in such a way that you do not have to come to a complete stop in front of it. Always scan the area for suspicious looking people. Also, ensure enough lighting in your driveway and minimal bushes or other places to hide. Be aware of vehicles that are following you, especially from airports. If you suspect they are following you, drive around the block to see if it continues. If it does, drive directly to your nearest police station. Stay away from dark and lonely places. Try to park in secure areas. Keep your valuable possessions out of sight. Lastly, by purchasing a low risk vehicle, your chances of getting hijacked will also be reduced. The ombudsman for short-term insurance in South Africa gets more than 10,000 complaints a year, where around 50% of them are car insurance related. So, we wanted to know, why are so many of the car insurance claims getting rejected? Drunk driving – This goes without saying, but if you are involved in an accident under the influence, you are supposed to go to straight to jail. Believe it or not, but some people still try to claim from their insurance company when they ruined their car under the influence of alcohol. This is illegal. Do not try to claim from your insurance when you were under the influence, and simply, do not drink and drive! Unlicensed driver – We all started learning to drive somewhere in our lives. Whether it was on your grandpa’s farm, through the cemetery or on the quite roads of the town you lived in. If you want to teach your child how to drive, do it in a safe environment and never let them drive alone. As they do not have much experience, accidents tend to happen. Some people try to claim from their insurance when it was their unlicensed son or daughter that caused the accident. Your insurance company will reject your claim if this is the case. Inaccurate or incomplete information given at the claim’s stage – Remember that any time an insurance company receives inaccurate claim information they immediately suspect fraud. Try to note as much information as you can remember from the incident when claiming, as this will decrease your chances of getting rejected. Don’t just say “I crashed” or “Someone pushed me off the road” etc. Give as much detail as you can when filing a claim. The ‘Regular driver’ was not driving the vehicle – This is something that happens a lot. You get a policy and declare yourself as the ‘regular driver’. Now your wife drives your car and gets in an accident. If your policy states that they will only pay out when the ‘regular driver’ was driving, then they will not pay out in this scenario. You can get your insurance company to include a ‘named driver’, or ‘any licenced driver’ in your policy. This will of course be more expensive, but you will be covered in most cases. Mechanical breakdowns – Be sure that you service your vehicle regularly. When the time comes that you have a mechanical breakdown, your insurer may not pay out if your vehicle has not been taken for a regular service. Using your vehicle for business purposes – Let’s say you have a transporting or delivery company. When your personal vehicle gets damaged while transporting goods for your business, you cannot claim that from your personal insurance. The same goes if you are Taxi driver. You must understand that your insurance rates are determined by your risk profile. People who are on the road several hours a day, will pay more than people who just drive to work and home every day. Do not use your personal vehicle for business purposes and then expect the insurance company to pay out when something goes wrong. 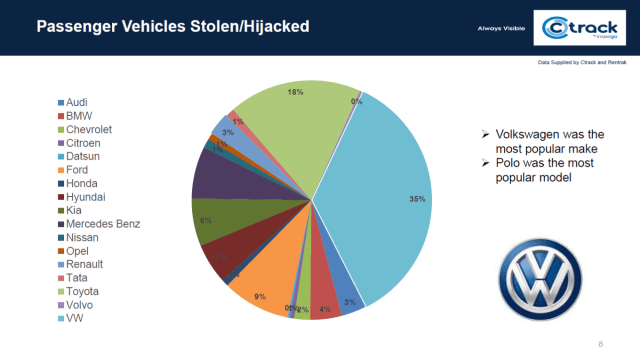 Satellite tracking not fitted – It is no secret that South Africa is a high risk country and vehicles get stolen a lot. Insurance companies can’t give you a guarantee that your vehicle will be returned if you have no tracking device installed. Do not remove your tracking device or refuse to get it installed. When the time comes that your vehicle gets stolen and the insurer realizes you never had any tracking device installed, you may not get anything out of the claim. Leaving the scene unlawfully – There are certain steps you need to take before you leave the scene. Read the policy terms so that you understand what you can and cannot do. Do not just take a picture of the car that crashed into you and then leave the scene, for example (this is actually something many people do these days). Normally it is required that you get a police report before you can claim. This means that you should actually wait for the police to arrive and write a report. If you do not follow the rules that were given to you beforehand, you may end up in a big argument on HelloPeter.com, without you ever receiving a single rand from you insurer. Security device not fitted – There are many different security devices you can install into your vehicle. These can include immobilizers, alarm systems, tracking devices and many more. The more secure your vehicle is, the less you will pay for insurance. Keep in mind that if you do not have some kind of security device installed in your vehicle, it is easier to steal your car. Most insurance companies do need some security devices to be installed. Unroadworthy vehicles – Ensure that your wipers are in working condition and your tires have some thread to run on. If you get into an accident and it turns out that your tires were smooth during the time, or that your wipers were not working properly, the insurance company may assume you were responsible for the accident due to negligence. Total-loss policy – If your vehicle is a total written off, there may be certain conditions on which the policy will pay out. Telematics data – There are telematics devices that will reveal whether it was the driver’s fault when an accident occurred. This data may count against you and some cases. We hope this article made it clear why your insurer wouldn’t pay out in certain events. Follow these points and you will increase your chances of your claim getting accepted. Visit this page if you want to get more information about car insurance in South Africa. Hierdie polis dek meeste skade aan u voertuig. Dit sluit in ongelukke, natuurrampe, diefstal, vandalisme en skade aan ‘n derde party of sy eiendom ook in. Neem net in ag dat as u nuwe vellings of ‘n klankstelsel in u motor ingesit het, mag dekking daarvoor dalk nie in die polis ingesluit wees nie. Daarvoor sal mens addisionele dekking moet kry. Hierdie polis dek enige skade wat u aan ‘n derde party se motor, of enige van sy ander eiendom aangerig het. Dit sluit gewoonlik ook enige mediese onkostes van die derde party in. Dit sluit alles in wat genoem is by derde party dekking, sowel as enige skade aan u eie voertuig as gevolg van natuurrampe* en kaping/diefstal. Let wel dat u eie motor nie gedek is nie, u sal dus self vir die skade daaraan moet betaal. Wat bepaal die premie van my voertuigversekering? Word die voertuig op ‘n veilige plek parkeer deur die nag? Waar word die voertuig deur die dag parkeer? Is daar anti-diefstal toestelle in die motor ingebou? Hoe lank het die drywer al ‘n lisensie en was hy/sy al voorheen in ‘n ongeluk betrokke? Hoe kies ek die regte versekeringsmaatskappy? Die antwoord op hierdie vraag is nie so eenvoudig nie. Ons stel voor u kry eers ‘n paar versekeringskwotasies sodat u kan sien watter maatskappye is mees bekostigbaar. Kyk dan na die voordele en nadele van die polisse wat hulle aanbied, ook of dit nodig gaan wees om enige addisionele dekking by te moet vat. Laastens, doen bietjie navorsing om te sien hoe tevrede is die kliënte met die diens van die versekeraar. Besoek ‘n webtuiste soos https://www.hellopeter.com/ om ander se klagtes te sien. Hou in gedagte, HelloPeter is gemaak om te kla, mense is nie altyd geneig om hulle positiewe ervaring daarop te sit nie. Moet dus nie alleenlik op negatiewe terugvoer staatmaak nie om ‘n besluit te maak nie. Kyk of die maatskappy wel kommentaar lewer op die klagtes, en of hulle die probleme wat die kliënte ervaar probeer oplos. So kan mens ‘n idee kry hoe die maatskappy hulle kliënte hanteer. Vir Engelse weergawe van hierdie bladsy, klik hier.